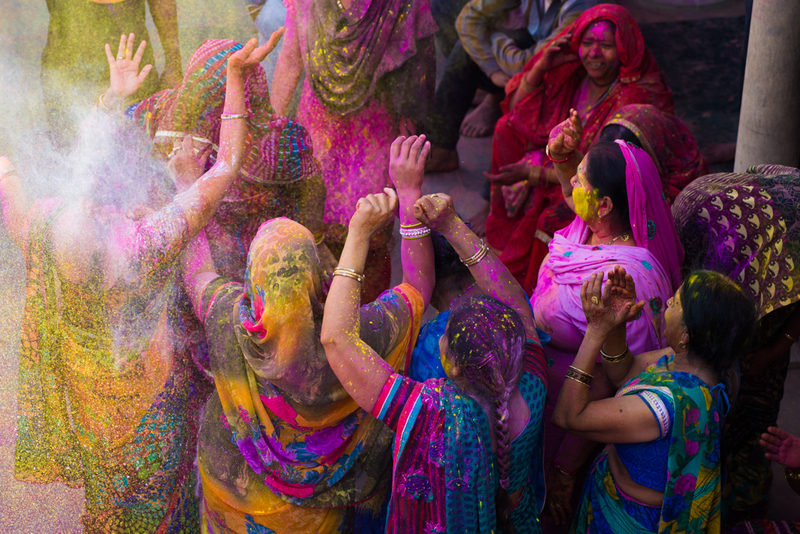 Holi in India is a festivity of colors and a celebration of colorfulness. 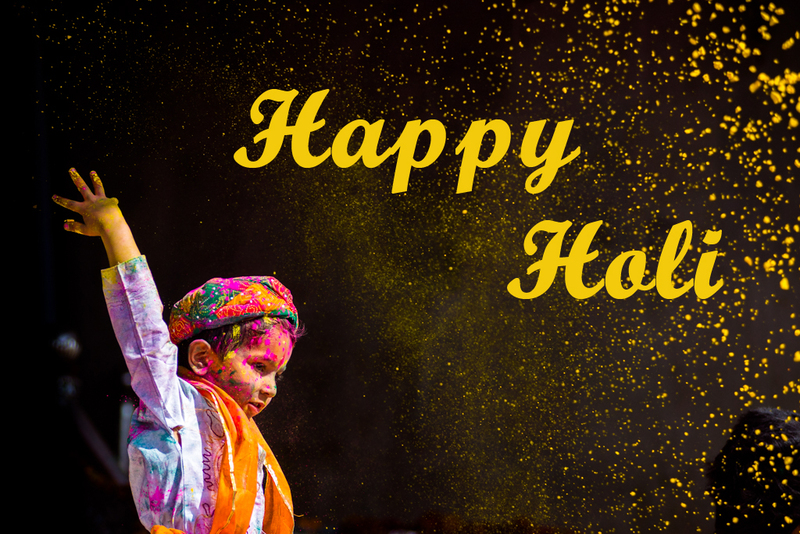 It is the only Indian festival when all different colors get mingled with each other to create a unique miasma of love and harmony. The celebration of Holi has been a ubiquitous thread like a key motif in the socio-cultural fabric of India since the time immemorial. Every nook and corner boasts the frenzy of this festivity, but the exuberance brims over at Barsana and Nandgaon in Uttar Pradesh, which Indian Eagle reveals through the photographs of Lathmar Holi festival from Saurabh Chatterjee in Hyderabad. 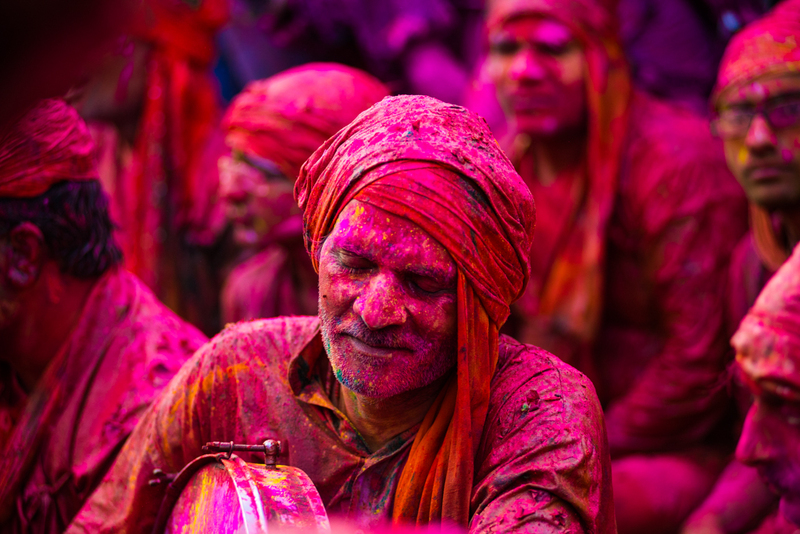 The Holi Festival is known as Lathmar Holi in Barsana, Uttar Pradesh. 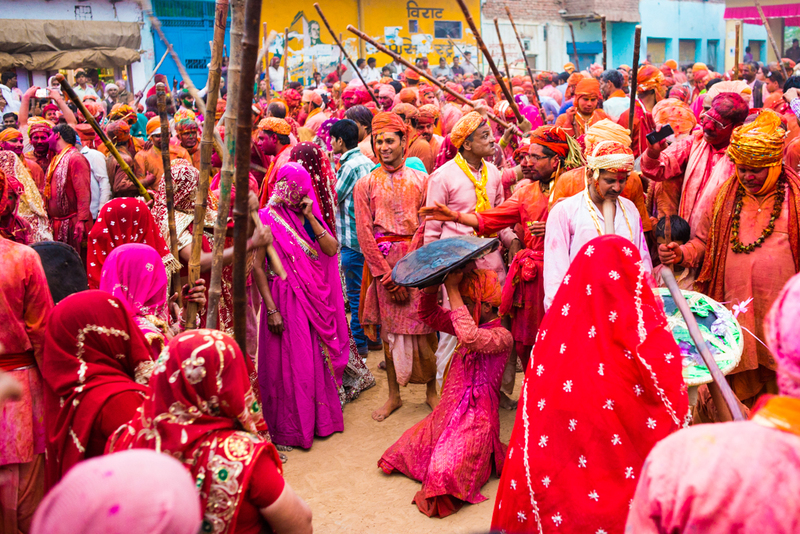 A 115-km drive from New Delhi, Barsana is one of the best places to celebrate Holi in India. 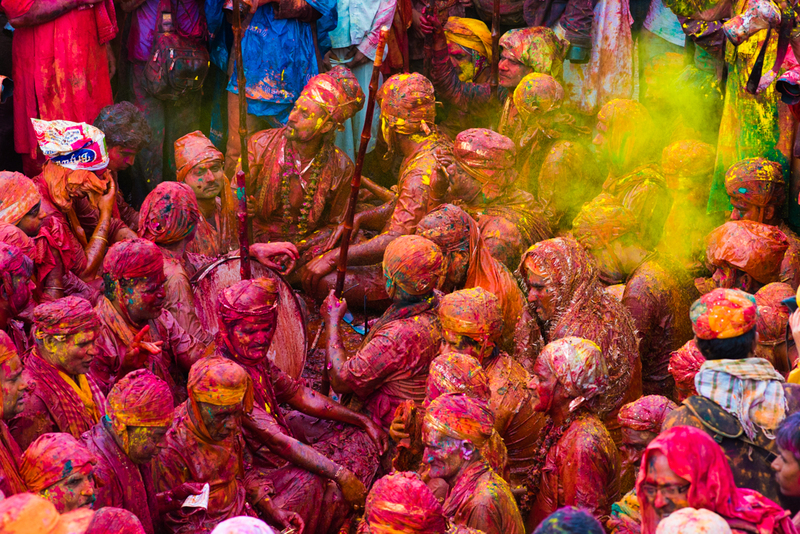 The way the natives of Barsana and Nandgaon celebrate Lathmar Holi is unique to offbeat India. 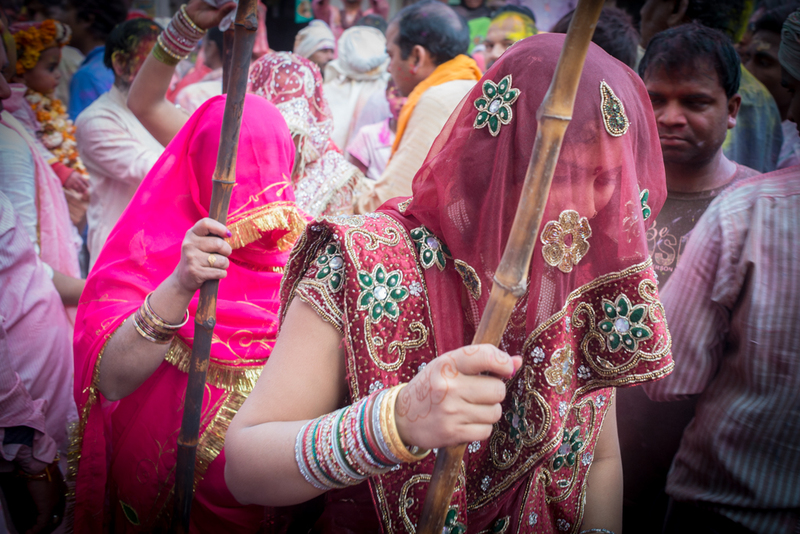 The tradition of Barsana’s women beating the men of Nandgaon with wooden sticks (lathi) playfully refers to the legend of Lord Krishna’s mischievous celebration of Holi with Radha and other gopis (belles) in Barasana village. The women of Barsana are dressed in traditional wears with veils hanging over their faces. 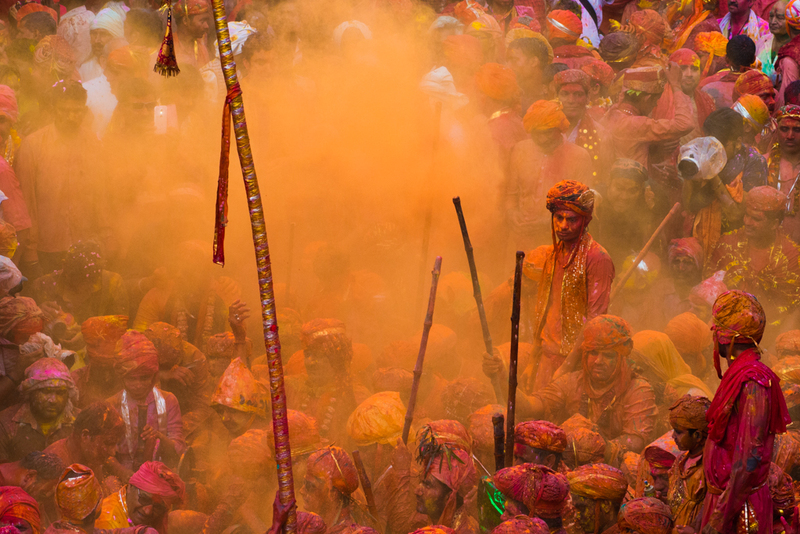 They chase the men of Nandgaon, with wooden sticks in their hands. There is only one temple in honor of Radha in Barsana. The Radha Temple is the axis of the Lathmar Holi festival. Hundreds of men and women of all ages gather in the temple complex for celebration. The women of Barsana in full swing of the festivity! Dressed in Indian ethnic fashion, they enjoy themselves a lot over fun games. No one is identifiable in the pool of colors. The colors of love make them look alike creating a single canvas of love and harmony. A man from Nandgaon playing a musical instrument to deepen the vibe of the celebration. The natives of Barsana and Nandgaon enjoy themselves over folk songs adding to the symphony of joy during the celebration. 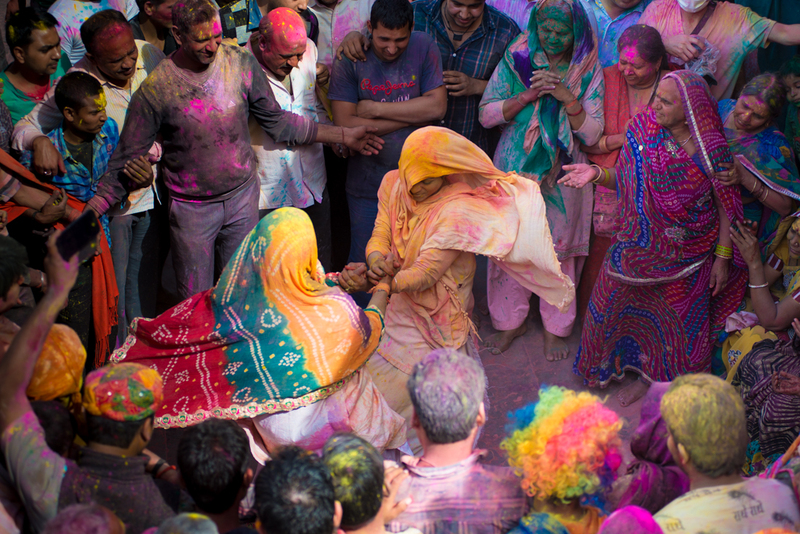 The enthusiasm of Barsana’s women knows no bounds! Their cheerfulness adds to the free spirit of the Lathmar Holi celebration, which spreads far and leaves an indelible impression on the minds of onlookers. 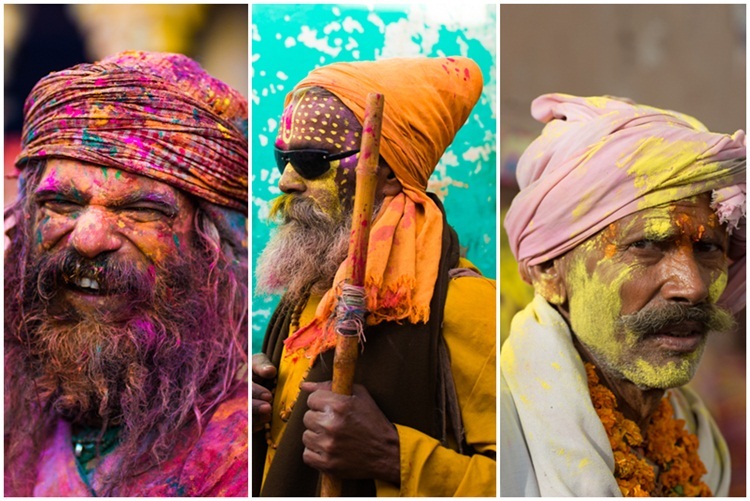 The old and the hermits – no one is spared from the colors of Holi Festival in Barsana. The celebration does not keep the monks aloof from the rest of society. Each face is the face of India! 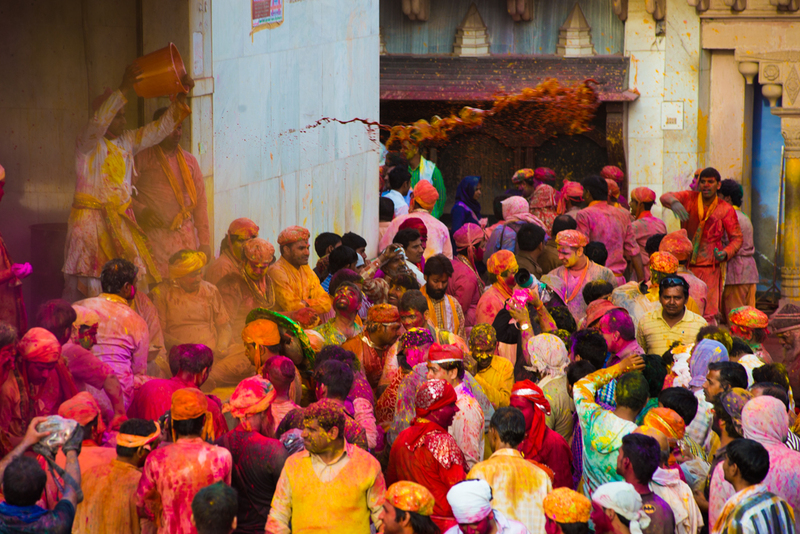 This photo story of Lathmar Holi Celebration is brought by Indian Eagle, a leading international travel organization inspiring tourists to travel India and booking their trips at the best prices. Saurabh Chatterjee is an award-winning professional photographer on a mission to capture the beauty India through his camera and initiate every camera owner into great photography through dedicated training. He is the founder of SIA Photography. His photographs have been published by National Geographic, Lonely Planet and other magazines of international repute. One of the best collection of Holi Pics !!! This is awesome & would make all those nostalgic & emotional who are miles away from these kind of celebrations. Wish you all the best in your future endeavors !! !